My boys have an addiction. It is a sickness that only continues to grow. They are obsessed with Star Wars. The mass of toys that overflows my home, tumbles down the stairs, and causes great pain to tender feet, makes this mommy go a little wookie. We have enough Star Wars tours to reach Tatooine and back! Please join me on a tour of the Dark Side, also known as action figures gone wrong. This is the end table in my living room. I do believe those clones are about to become monster food. Every weekend we have a Star Wars marathon. We have the movies in both video and dvd. It's a necessity. 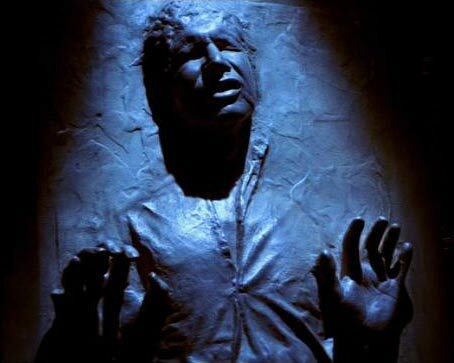 sudden urge to freeze him in some ice and tell my boys that Jaba got to him. 8 Light Sabers. I have 4 children so I guess that's 2 each. Hey, I can do math! Just 2 of the games. We also have more for the DS. We also have several Star Wars books. Not only do they play Star Wars, but they read Star Wars! A game controller. In case the other games fail to work. closet in case we have a midnight battle with evil droids. was gold but now he's silver. Hard water also makes limbs fall off. And the latest item to feed the sickness. Clone Wars. Every Day. Every single Day. I hate cartoons that have bigger breasts than myself. They certainly are cute fanatics!